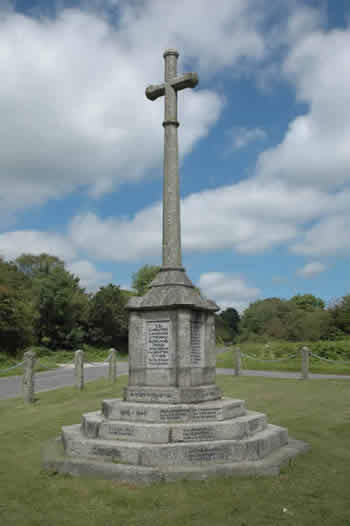 This memorial is sited at Crapstone which lies between Yelverton and Buckland Monachorum. The names of those killed in World war 2 are inscribed on the lower steps. Captain (Retired) Edward William Herford, RN, HMS Victory. Son of Robert and Dorothy Blake; husband of Lettice Audrey Blake of Victoria. Born in 1890. Died 20 April 1940 when HMS Victory was bombed, being the only casualty of the raid. D/K 22263 Leading Stoker Samuel Edwin Budge, RN, HMS Unicorn. Son of Charles and Loveday Hannah Budge; husband of Mary Emily Budge of Miltoncombe. Born in Callington, Cornwall 8 June 1895. Died 20 January 1944 aged 47. Buried in Buckland Monachorum Cemetery. K 9812 Stoker 2nd Class Michael Burke of the Royal Navy, HMS Drake. Husband of Mary (née Matthews). Born in Clifden, County Galloway 12 April 1891. Date of death not yet confirmed. T/17558 Driver William Edgar Chamings. Son of Rodney and Edith Chamings; husband of Daphne Elsie Chamings. Born in Whitchurch in 1903. Died 5 March 1941 aged 38. Lieutenant John Robert Byron Blake of the Devonshire Regiment, att to the 1st/7th Battalion, the Queen's Royal Regiment (West Surrey). Son of Brigadier John de Lisle Conry CIE and Dorothy Conry of Ealing. Born in Plymouth in the December Quarter of 1923. Died 15 June 1944 aged 20. 5621565 Gunner Wilfred Bernard Cook of the Royal Artillery. Son of Jane Cook and the late George Cook; husband of Gwyneth Maude Cook of Cowbridge, Glamorgan. Born in Tavistock in the |march Quarter of 1920. Died 4 May 1945 aged 24. 7359877 Private Joseph Arthur John Down of the RAMC, 26 General Hospital. Son of Arthur Z and Marie W Down of Yelverton. Born in Okehampton in the June Quarter of 1919. Died 16 March 1941 aged 22. 172427 Electrical Artifier 1st Class Arthur Alfred Edney of the Royal Navy, HM Submarine Triad. Son of Arthur John and Laura Edney; husband of Lilian Alice Edney of Portsmouth. Born in Gosport in June 1906. Died 20 October 1940 aged 34. Awarded the DSM while serving on HMS Wild Swan in 1936. 40823 Pilot Officer David Marwood Harry ,of the RAF, 201 Squadron. Son of Marwood Cyril and Elsie Beatrice Harry, of Bournemouth. Born in Warwickshire in the March Quarter of 1915. Died 9 July 1940 aged. 25. 5625173 Cyril Thomas Peter Haycroft of the 2nd Battalion, the Welch Regiment. Husband of Joan Winnifred Haycroft of Stonehouse, Plymouth. Born in Horrabridge in the March Quarter of 1905. Died 27 May 1940 aged 35. D/K 31464 Leading Stoker George Hearne of the Royal Navy, HMS Trinidad. Son of Harry and Thirza Hearne; husband of Bessie Hearne of Miltoncombe. Born in Tavistock 11 January 1896. Died 29 March 1942 aged 46. 744568 Staff Sergeant Russell Johnson Hicks of 153 battery, 51 Light Ack Ack Regiment, the Royal Artillery. Son of Sarah Hicks. Born in Horrabridge in the March Quarter of 1905. Died 27 May 1940 aged 35. 114412931 Private Joseph Roy Lowden of the Pioneer Corps. Son of William and Mary Jane Lowden. Born in the September Quarter of 1922. Died 3 November 1943 aged 21. D/K 156 Chief Stoker Sidney Alfred John Maben of the Royal Navy, HMS Ambrose. Son of Robert and Jane Maben of Buckland Monachorum. Born in Buckland 27 April 1889. Died 15 June 1943 aged 54. Buried in Buckland Monachorum Cemetery. 270578 C/JX 270578 Convoy Signalman George Ivor Nailard, the Royal Navy, SS Nova Scotia. Son of Thomas and Mary Alice Nailard of Brighton. Born in Kensington in the September Quarter of 1922. Died 28 November 1942 aged 20. Commander Trevylyan Michael Napier, RN, HMS Jackal. Son of Vice-Admiral Sir Trevylyan Dacres Willes Napier KCB; MVO and his wife Lady Napier ; husband of Priscilla Napier of Sedgehill. Born in Kensington in the June Quarter of 1901. Died of illness 30 August 1940 aged 39. Awarded the DSC. D/K 27301 Stoker 1st Class John Northey of the Royal Navy, HMS Courageous. Son of James and Rhoda Northey of Buckland Monchorum; husband of Alberta Winnifred Northey of Buckland. Born in Roborough in 1899. Died 17 September 1939 aged 40. 47494 Pilot Officer under training Michael Robert Piper, of the RAF. Son of Frederick Edwin and Mabel Piper, of Plymouth. Born in Devonport in the September Quarter of 1920. Died 27 August 1942 aged 22. Captain George Stanley Pitts of the Royal Marines, HMS Barham. Son of Stanley Thomas and Alice M. Pitts; husband of Eve Josephine Pitts. Born in the March Quarter of 1914. Died 25 November 1941 aged 27. Rear Admiral Richard Anthony Aston Plowden, RN (Retired), HMS Eaglet II. Son of Charles and Josephine Plowden; husband of Phillys Mary Higginson. Born 24 May 1881 in Rowen, Conwy, Wales. Missing along with 8 other men after action 24 February 1941 aged 59. The reason why Rear Admiral Plowden ended up on board The British vessel SS Sirikishna is not clear. The steamer was sailing as part of a convoy which became dispersed. Convoy Commodore Plowden was lost when the steamer was torpedoed and sunk by submarine U96. Civilian Mr. Hilary Cameron Russell Rendle was, before the war, a District Officer in Malaya. He was the son of Dr. C. E. R. Rendle and husband of Patricia Rendle of Furzeleigh, Yelverton. He died 26 October 1944 aged 46 at Outram Road prison, Singapore - a punishment camp where the Japanese sent prisoners. After the war the commandant of the camp was tried in a war crimes court for his treatment of 12 civilians (including Hilary Rendle). Evidence was given that Mr Rendle died of dysentry and beriberi contracted in the horrific conditions of the prison. Commander Donovan Connor Roe of the Royal Navy, HMS Hood. The only son of George Tennant Roe and Bertha Nugent (née Nixon) of Yelverton, Devon. Born in Bideford in December 1892. Died 21 May 1941. He was appointed as the Battle Cruiser Squadron Accounting Officer aboard H.M.S. Hood from 25 March 1939 until his death in the sinking of Hood on 24 May 1941. He is also commemorated in the church at Yelverton. Lieutenant Peter Gordon Sedwick, RN, HMS Sikh. Son of Rear-Admiral Cyril Gordon Sedgwick, C.B., and Elsie Sedgwick; husband of Pamela Mary Sedgwick, of Halberton, Died as a Prisoner of War of the Italians 18 October 1942 aged 28. Casualties on HMS Sikh were 15 officers, including Capt. Micklethwaite, and 260 ratings. A few survivors reached the Italian coast and became prisoners of war. 194913 Lieutenant Geoffrey Maurice Shawyer of the 2nd Battalion, the King's Royal Rifle Corps. Son of Charles William and Fanny Gertrude Shawyer of Yelverton. Born in 1922. Died 16 August 1944 aged 22. 870685 Corporal Gerald Rupert Steer..Son of William Elias Steer and Alice Steer. Born in Horrabridge in 1917. Died 25 March 1946. Buried in Horrabridge churchyard. 114426 Pilot Officer Russell James Weeks. Son of John and Mary Elizabeth Weeks; husband of Elizabeth Chrissie Weeks of Yelverton. Born in Northhill, Cornwall in 1907. Died 15 June 1942 aged 35.